The Serpent's Corruption is an ethereal giant snake found in the final room of Reinhold's Retreat. 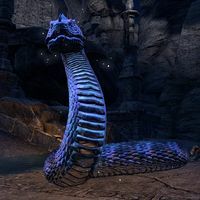 It is an avatar of the Serpent, who is attempting to corrupt the Thief's Apex Stone. You will need to defeat the snake during the related quest. This page was last modified on 30 March 2018, at 20:37.